fifa ballon d’or 2010: journalists wouldn’t have given messi the award! in the spirit of the golden globes later today, i was having a look at the detailed votes for this years fifa balon d’or, won by my favorite lionel messi. for the first time, not only the votes of the world’s captains and coaches were taken into consideration, but also the journalist’s opinion, which i tend to see as the most exact one. i also don’t like the many votes coming from countries with no or little tradition in football, and maybe biased opinion (africans vote drogba, other small countries vote for the traditional best like cristiano ronaldo). so here, i present to you a more detailed look at fifa’s list, creating from it a fairer one, in my opinion. at the end, there were five clear favorites, garnering almost 80% of all votes. forlan had a great world cup and a great european season right before that; he won the golden ball for the world cup's best player and has deserved be ranked the 5th in the world. i picked out the votes of the captains from football nations that should have a say in this vote (i chose 48 nations), and this is the top ten based soley on their votes (5 points for first place, 3 points for second place and 1 point for third place). wesley sneijder was fantastic in this year's uefa champions league and had a great world cup, with two goals against brazil as high point. he came in 4th place in the official fifa vote. a very clear vote for messi, even clearer than that of the players. cristiano ronaldo gets twice the points here, compared to the players, and both thomas müller and david villa weren’t even mentioned by the players, but made the top ten with the coaches. barcelona playes the best club football of the world, spain is the best team in the world. iniesta and xavi are the heart of both teams; one is considered the best playmaker in the world, the other scored the world cup winning goal in the final against holland! it is clear to see that the media weren’t really sure who to choose: sneijder was mentioned 46 out of 68 times, xavi had the most votes for first place (21), but iniesta would have a slim lead to win. messi is only fourth place in this vote, and almost everyone voted for three of the top five. this seems to be the most coherent list, to me. he lost to germany with argentina, but was still voted the best by players and coaches around the world; only the media would have voted him 4th place, but he still came away with the win! maicon is the best brazilian (! ), and six in the top ten are spanish players (!!) showing their supremacy in the world. all in all, the combined vote of the ballon d’or (which used to be called european footballer of the year) and fifa’s world footballer prize is still not even enought, for my taste. i do think the right player won, but generally i believe journalists should have a greater say on who should be considered the best; the way to do that would be to give football nations more journalistic votes if they have more football tradition – it can’t be that there is only one english, german or brazilian journalist voting, compared to one of swaziland, uganda and french guinea! history of the world cup. 19 tournaments from 1930 until 2010. the [sports] observer will take a look at this long and rich history by looking at the top ten nations in the history of the tournament. and we’ll start with the dutch. actually it’s pretty incredible. the whole country has a population around five million smaller than the metropolitan area of são paulo, brazil’s largest city. how can a country with only 16 million people have such a rich story in football history? and how rich is that history, after all? actually, it started only in 1970. ok, holland played in the two pre-second world war worldcups, but that was pretty much everything. 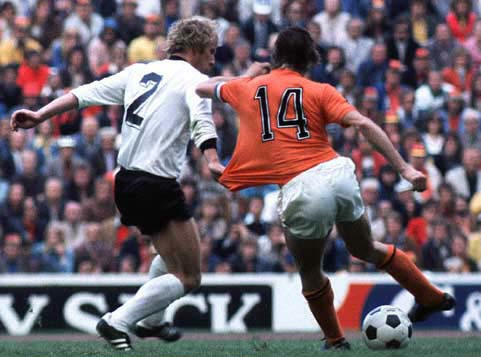 the oranje have played a total of nine out of nineteen world cups, only two before 1974; and they were still favorites to win that tournament, a phenomenom never observed since then. what had happened? november 26, 1969. the second round of the european cup had their round of second legs. the round of sixteen, and feyenoord rotterdam were playing ac milan for an unlikely place in the quarterfinal. the 0x1 defeat in the north italian city didn’t seem that tragic, but it was the italian champion, always a favorite to reach the semifinals, at the very least. almost 64,000 people came to see the game, and saw history in the making, without realising it: feyenoord sent milan home with a convincing 2×0, surprising the continent. not that the dutch team was a total dark horse, they had been in the semifinals in the 60s once. and this time, they went to the final, after eliminanting the eastern german and polish champions, where they would face celtic glasgow. we know celtic as a traditional team today, but at that time, it was arguably the best team in europe. still, for the second season in a row, a dutch team had reached the final (1969 it was ajax amsterdam), and for the first time, they actually won it. leading up to the 1974 world cup, dutch football started to completely dominate europe. in club football with five dutch finalists in a row at the european cup finals, and, foremost, four titles in a row (three times ajax after the feyenoord truimph). in international football, the reason for that success was starting to become visible, although the results weren’t quite there yet. yugoslavia eliminated the netherlands from the euro competition, but the dutch scored 14 goals against luxemburg in that group – against seven goals by the east germans and only two by yugoslavia. that was the philosophy: attacking and attractive football, variable and lively. all of that would have been impossible without the genius of johan cruyff, team leader and idea leader for ajax and the national team. the idea was that the players should not be limited to staying at a specific area of the field; the team should be compact and in constant movement, including the switching of positions during the game. this idea really became prominent in the 1974 world cup, when cruyff had already moved to fc barcelona. a world cup in the neighboring germany, their main rivals, would be interesting. 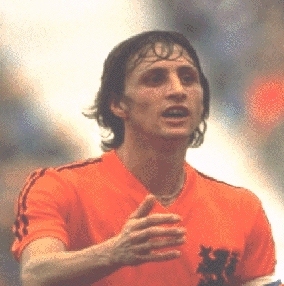 cruyff was seen as the world’s greatest player, alongside the german franz beckenbauer, who played a similar role in the more “organized” german team. the two teams did meet in the final of that tournament. and it was not as “modern x traditional” or “liberal x conservative” as it might seem, but an important thing happenend. the dutch lost, but the idea didn’t. the small western european country had fallen in love with their way of playing football, it gave them an identity. and identity seeminlgy more important than big titles. four years later, holland reached the final again – and lost to the host country, again, this time after extra time. but they were now a respected member of the world football community, with a whole country behind their efforts. the dutch idea didn’t die, but you have to have the players to perform it. after cruyff left, the team didn’t have any success and failed to qualify for the 1982 and 1986 tournaments; in 1982, neighbors belgium, italy and even ireland were more successful. 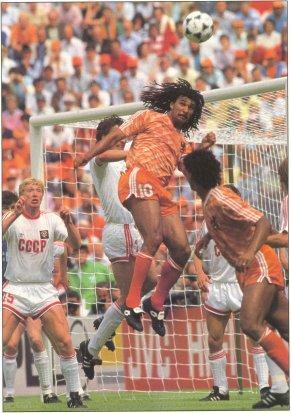 and in november 20, 1985, another decisive match took place for holland. against belgium, the only playoff to qualify, the 2nd leg match was at home. and after a 0x1 loss in brussels, the team was leading 2×0 until five minutes from time, when belgium scored the decisive goal, eliminating the dutch. this was the beginning of the second era of dutch football. spectualar football, still, and the now world famous 4-3-3 dutch system was still in place; but new talent was now given a chance, and the trio frank rijkaard, ruud gullit and marco van basten started revolutionaring the old dutch game, adding mental and physical strength to the formula. 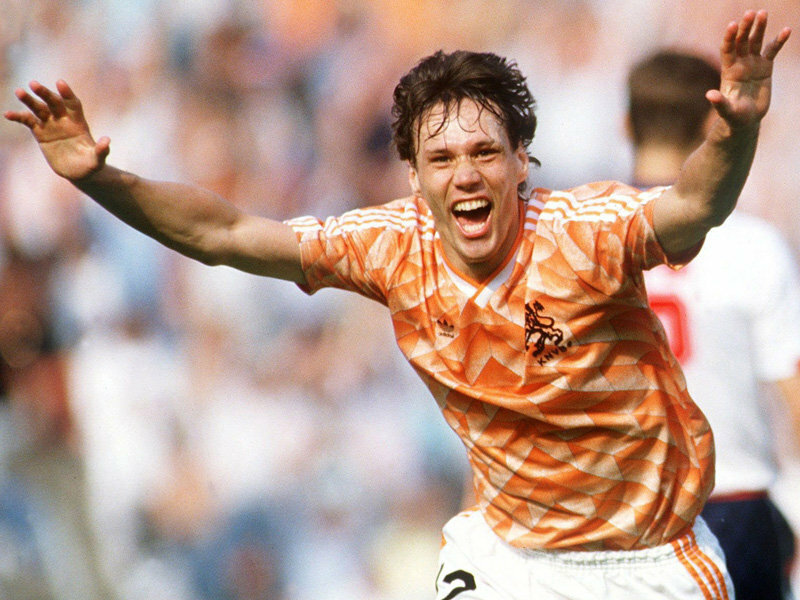 holland won their first major title not even three years after the trauma against belgium, at the euro 88 in germany. the aforementioned trio was now considered to be top players in the world, and all of them were playing for ac milan, the best club in the world at the time. so 1990 seemed to look a lot like 1974, with the experienced germans and the new dutch team coming in as main favorites for the title. gullit, here assisting to the goal of a century by van basten in the euro 88 final against ussr, was the captain of the promising dutch team or the 1990 world cup. they met in a historical match in the round of 16, since holland wasn’t playing as well as expected and suffered in the group phase. in one of the most thrilling matches of world cup history, the germans beat holland with merit, after they had lost in the euro 88 semifinal. but netherland was back on the map, 12 years after their loss to argentina in the final. and they proved it. new talent was arising every year, ajax amsterdam had some very successful years in europe under louis van gaal, and holland were probably one of the most exciting teams of the 94 world cup, losing in the quarterfinal to champions brazil after coming back from 0x2 to tie the game, and still loose it. but they lost in dutch style, and the idea of attractive football coming from the small flat country was still alive. this idea gained new force in the 98 world cup, held in france. 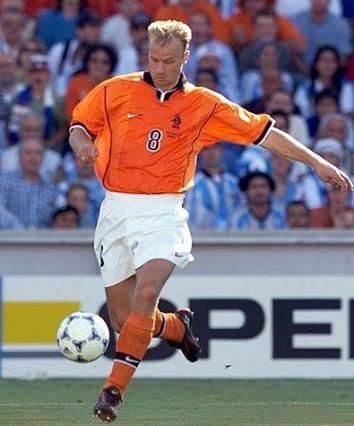 holland were the most exciting team and reached the semifinal after two thrilling knockout stage matches: edgar davids scored the winning goal against yugoslavia in overtime, dennis bergkamp had the most spectacular moment of his brilliant career two minutes from time against argentina, also a 2×1 win. and when holland tied the game five minutes from time against brazil, with a young patrick kluivert scoring the goal, the team finally seemed ready for a big title. one of the main tradicional problems in the dutch team was the seperation between white players and black players, and this wasn’t an issue in that 98 world cup. brazil went on to beat the dutch in the penalty shootout, but once again a whole country was proud. the idea of beautiful football was slowly starting to get on the nerves of dutch players. the home euro in 2000 was not won, and louis van gaal failed to qualify with the team for the 2002 world championship, by now a huge surprise. this more than anything showed that holland was rightly considered a power house in international football, but that failing to qualify started changing the idea of the beautiful game. dutch players wanted to finally win titles! the 4-3-3 idea with two offensive wingers and less concentration on defensive work was starting to give way to a 4-4-2 system, more traditional and maybe more successful? the answer in the 2006 world cup was horrible for the players and, even more, for the fans. holland didn’t play their attractive football, and lost to portugal in the round of 16, in quite a violent match. the defeat wasn’t the worst thing, it was the way they played football. the experiment of “playing like the germans”, the more successful neighbors, was deemed unsuccessful, and fans, media and former players wanted the “dutch way”, the dutch football philosophy back. and they got it back. the euro 2008, maybe the best football competition in history, saw holland play the way the whole world expects them to play. maybe only brazil has a similar global expectation, and everyone was glad when holland started out beating world champions italy by 3×0, and then france by 4×1. that was the holland everyone wanted. and in a very attractive match, the russians (led by dutch coach guus hiddink) beat holland in the quarter-final, a 3×1 after extra time. once again, the beautiful game hadn’t led to the title. 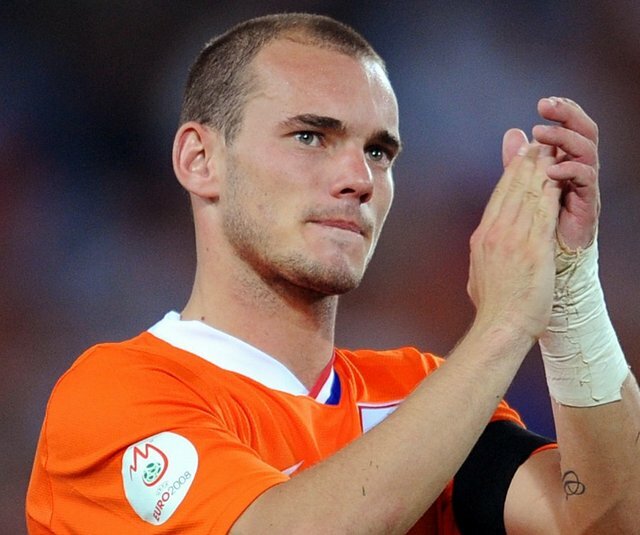 the current face of dutch football: wesley sneijder, ex-real madrid and now champions league winner with internazionale. so holland played the german game in the last world cup. no attractive football, but this time they beat brazil in the quarterfinals and actually reached the final; but not as favorites. and, even worse for the dutch fans, not even as crowd favorites, since the spaniards were now known for playing beautiful football – much more than the dutch. that’s why this, the third defeat in a world cup final, was by far the worst. and, for many former players and journalists, the only worse thing would have been an actual world cup title, since that would have vindicated the now “ugly game” the dutch became famous for in the very violent final. the tenth greatest football national in world cup history has to ask itself what it wants: to first play beautiful football and then win titles? or to win titles at any cost? this writer hopes that the dutch philosophy is revived, and that they may win a title with that. it doesn’t look likely for 2014, though. 2010’s best player: who is it? some might think: wait, 2010 is not over yet! why should we discuss this topic already? i’ll tell you why: for the selection of football’s greatest player in 2010, the season is already over. traditionally, the national and european club competitions decide the trophy, it is the spring form that really counts, the time where trophies are handed out and stars or born or transformed into myths. and, of course, if there is summer football (this year it was more winter than summer), then that will decide the race even more. so who is it? who has left their mark, and who has lifted those trophies? here a quick look of a possible top ten for the season. xavi & iniesta, the dream duo in barcelona, and also at the world cup. ok, fc barcelona lost to internazionale in the semifinal of he champions league, and we still have no defending champions in the champions league era. but xavi had a pretty good season and once again lead fc barcelona to the spanish title – and he was the maestro of a great spanish side, the true captain and boss in midfield. with his elegance and intelligence, he was one of the stars of the last world cup, and as world champion, he has a shot on the biggest price in individual football glory. how long have we known him now? 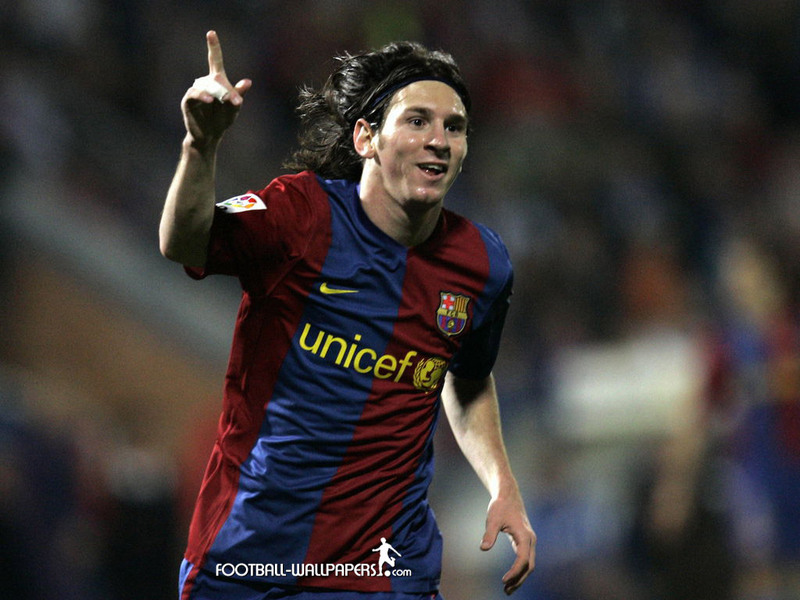 as a very young player always getting some playing time at barcelona, and showing his technical ability. iniesta was only a super-sub, now he’s the heart of barcelona and the spanish national football team. raul wanted to play, but iniesta took away that position – and he scored the decisive goal in extra time, to give spain their first world cup title. iniesta had a really good world cup, but was injured in the decisive phase of the champions league – a reason why barca didn’t defend their title? messi tries to do his best against germany... wasn't his day. he was already the best. there was no-one really near him before this historical night in april. fc messi 4×0 arsenal fc, maybe the best ever performance of any football player in a match of that magnitude, ever. am i exaggerating? then try to remember a counter-example. not even maradona against england in 86 played the kind of game that we saw from lionel. and until argentina’s 0x4 against germany, he was on his way to become the world cup star – somewhat surprinsingly, since his performances for argentina had never been impressive. no title this year, but messi was the main goal scorer in the uefa champions league season – and there was this incredible game against arsenal. enough for the 2010 best player title? not his day, either... cristiano ronaldo after the match against spain. maybe he has not shined the way he used to for manchester united, but cristiano ronaldo has been bery effective for real madrid, and one can speak of a all in all succesful first season. but he wasn’t able to avoid another real madrid waterloo in the champions league; in the league, even a record amount of points wasn’t enough to end barcelona’s reign. and the world cup will not be one of his fondest life memories, either. sneijder & robben celebrate the victory over brazil, with kuyt. he was a bit of an mvp, maybe even more than his compatriot. for bayern munich, which he joined after also being dismissed by spanish giants real. robben scored the decisive goals in the win-losses at fiorentina and manchester (both 2-3, but qualifying goals), and they were beautiful. even after injury in not in top form, he played a pretty good world cup and threw away the chance to be the star of the final, almost giving the netherlands an unjust victory in two occasions. but he did win the internationally growing bundesliga and the german cup (scoring another impressive goal in the semis), and he did reach the final with bayern munich. what a change, from “schweini” of world cup 2006 and euro 2008 to schweinsteiger in 2010. louis van gaal, his dutch coach at bayern, has finally given him his favorite position in he center of the defensive midfield, and schweinsteiger payed it back – for bayern and for germany, who without doubt played the most impressive football in this year’s world cup. as robben, schweinsteiger almost achieved the treble, and he ended up bronze medal inner at the world cup. but he did have a memorable game, when germany beat argentina 4×0. surely, that was one of he best performances of a single player in a big match, this year. forlan scores a goal against host south africa; that country will be a fond memory for he uruguain. that was a pretty impressive season by the aging uruguaian superstar. he’s had some pretty good seasons before, but the europa league title with atletico madrid finally gave him some silverware to hold. to win a european title with such a traditional team is already big, and scoring both goals in the final, one of them the winning goal in extra-time, is even bigger. can that be topped? yes it can, by 5 goals in the world cup, a semi-final spot for uruguay (doing better than continental opponents brazil and argentina) and the golden ball as the best player of the tournament; the first one of the kind to leave the competition without medal. respect, diego! hasn't scored for england in a year... but he had some great months earlier in 2010.
up to the first quarterfinal match in the uefa champions league in munich, it seemed like a simple question. 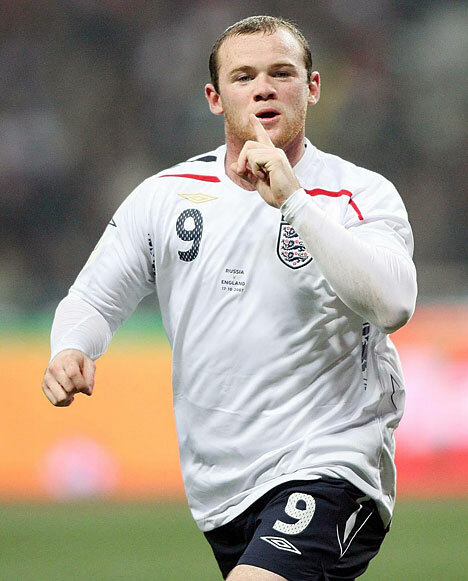 who is better, lionel messi or wayne rooney? the argentinian, current holder, was having another great season, but rooney seemed to make people in northwest england forget about “cr7” with great performances and a whole lot of goals, some of them spectacular and important. and in the beginning of he match in munich, he scored the first goal and seemed to move on into the direction of best player in the world. but in the last minute, he was injured, bayern scored the 2-1 winning goal, fergie let him back to early, and he has not reached his top form since. the world cup was his personal waterloo, not only the 1-4 loss to germany in the round of 16. but he was having a good season, and he was the number two man at the time. 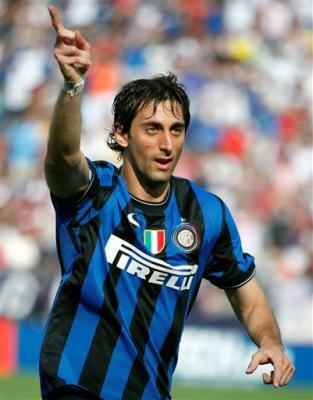 two goals in the champions league final, decisive in all titles, historical treble with inter - that's diego milito. it’s possible that some people knew his brother gabriel, defender at barcelona, better than him, although he has always been a pretty prolific goal scorer. but he hadn’t played at a top team yet, until “the special one” mourinho called him to inter duty at age 31. diego answered with goals, quite a few, and many very decisive. diego milito scored the decisive goal that gave inter their fith scudetto in a row, he scored the decisive goal in the coppa italia final against roma, and he scored both goals against bayern in the uefa champions league final, making the difference in that match. unfortunately for him, higuain was the starter for argentina in the world cup, but it was still an impressive season for diego milito. who would deserve the best player award in 2010 (you may choose up to four)?